You really don't need a lot of time, money or know how to make upcycling magic happen. Case in point - this chair from the Salvation Army thrift store. I bought it back in 2011 for $10. I wanted another chair to add to my dining room table and this was the one! 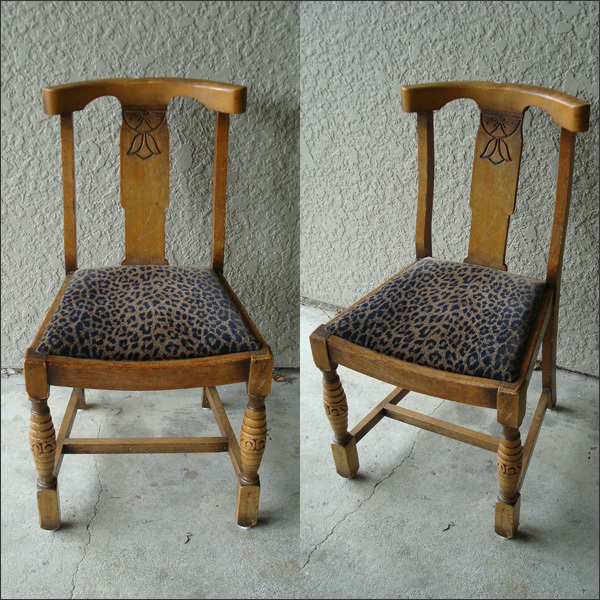 The chair had a shellac type finish plus the fabric was a fuzzy dark leopard pattern. Ugh... It was ugly! 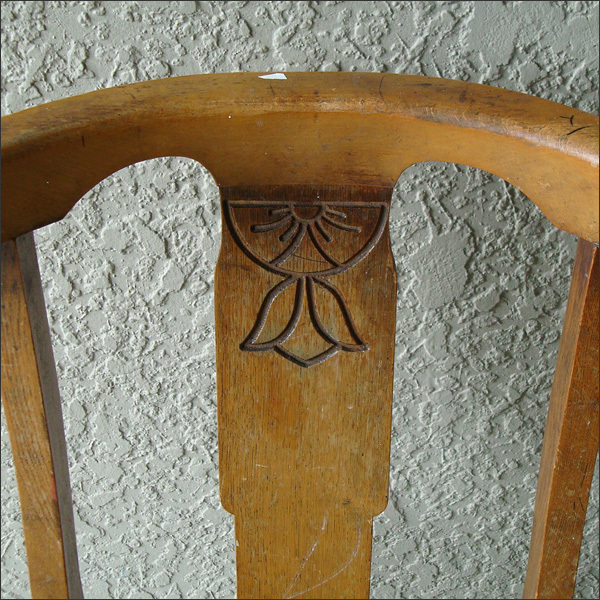 The wood had some interesting details like this flower cut into the back part of the chair. The finish though seemed a bit dark and dirty. Maybe a quick sanding job would help bring it to life? Maybe an oil or stain would add some pizzazz? It was worth a try! 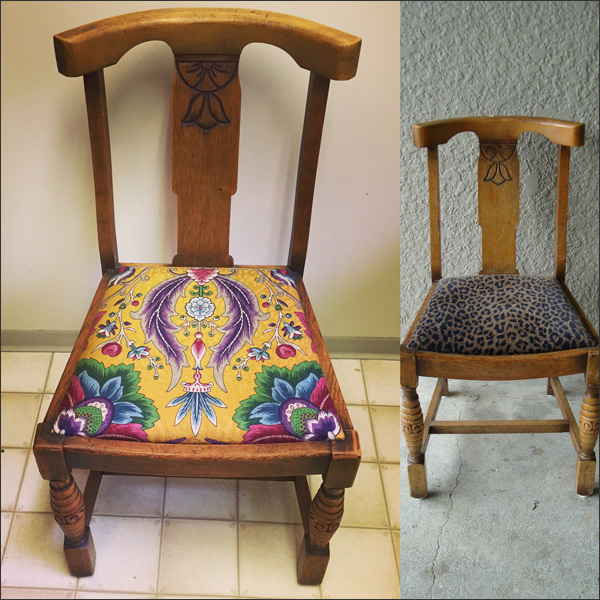 Here's my first chair refresh back in 2011 - I refinished and reupholstered the chair with this lovely fabric. 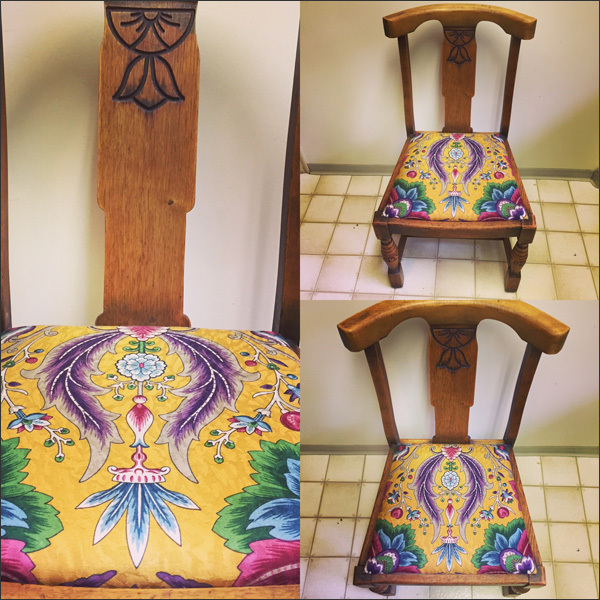 As I was reupholstering another dining room chair with this fabric recently, I decided this thrift store find needed a new look as well. I adore this fabric I found at the Salvation Army thrift store a few years ago! 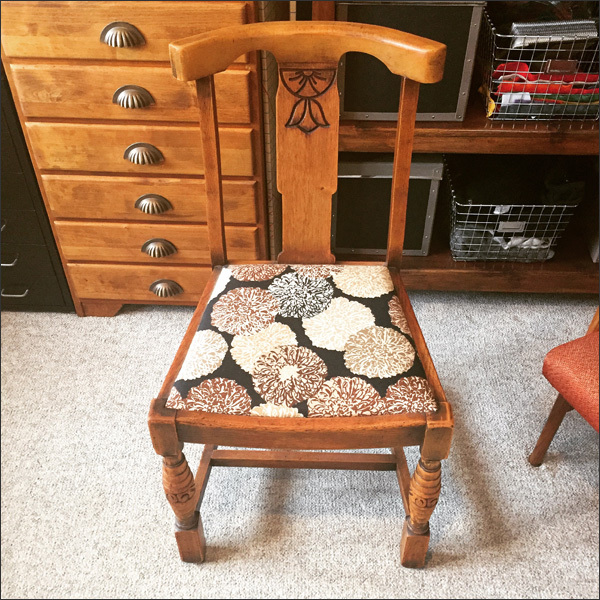 So here's the big reveal - this chair look stunning now especially when you see the before. Wow! 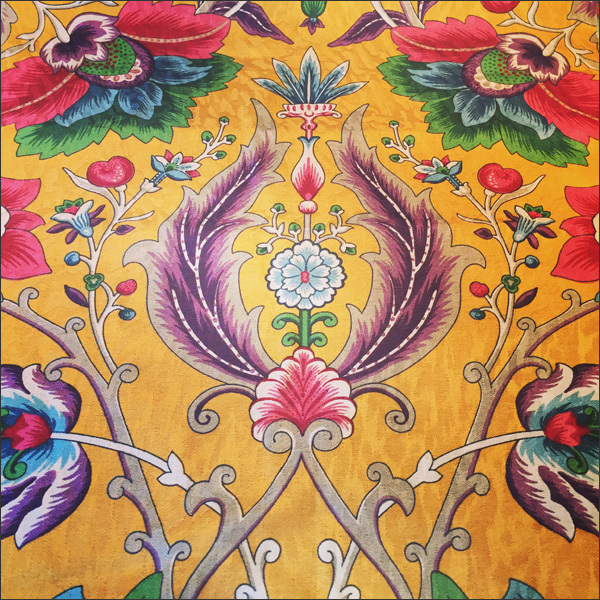 I love the pattern and colours in this thrift store fabric. And my $10 secondhand chair looks amazing! There is nothing more inspiring than a good before and after - don't you think? I'm revved to get my free chair update done ASAP. Here's to making more discarded chairs look awesome! Denise Corcoran (aka Thrifty By Design) is a local author, crafter, upcycler and workshop facilitator based in North Vancouver, BC. Her passion is to turn 'junk' into new and funky pieces. She shares her enthusiasm for crafting and upcycling by facilitating 'Crafternoons' throughout Vancouver. The crafty book I authored, Raw Crafts: 40 Projects from Hemp, Jute, Burlap & Cork, is now available online. The book includes 40 easy peasy DIYs using hemp, jute, burlap, cork and mixed media. It's being published through Lark Crafts. Join me for a Crafternoon! I'll be posting upcycling workshops to my TBD website. Hope to craft with you soon! Subscribe to my TBD Newsletter! Want to know the latest TBD news? Or about an upcoming Crafternoon? Sign up for my newsletter by entering your email address below. Easy peasy!